Gilas Pilipinas defeats Malaysia 106-51 for third straight win in SEABA - Balita Boss! 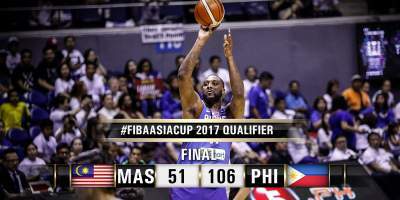 The Gilas Pilipinas kept their winning streak with a 106-51 victory over Malaysia in the 2017 SEABA Championship on Sunday, May 14. The Philippine national men's basketball team remain unbeaten with a 3-0 record, tied with Indonesia for first place. Malaysia dropped its third consecutive game. Jayson Castro had 10 points, four rebounds, and three assists to earn the best player of the game award. Andray Blatche and Troy Rosario led the team in scoring with 13 points apiece. Yee Tong Heng and Chun Hong Ting finished with 12 and 10 points, respectively for Malaysia. Gilas takes a break on Monday before playing on Tuesday, May 16 at 7 pm against Thailand, who lost to Indonesia 60-59 in Day 3 of the tournament.